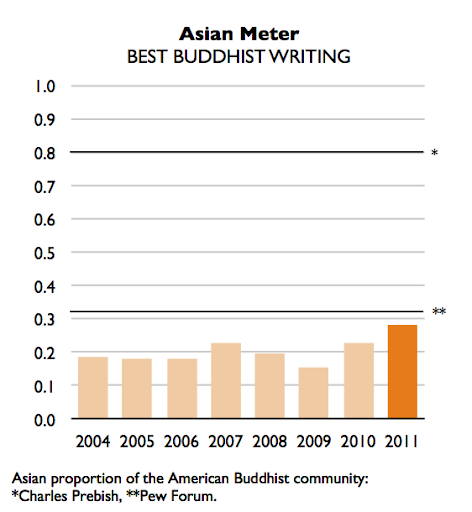 This year’s The Best Buddhist Writing 2011 has made positive strides across the board in the inclusion of Asian Buddhist writers. Nine of the 32 contributors are Asian. That’s more Asians than ever before. They also make up a larger proportion of the authors than ever before. You could say that this year’s volume is in fact the “most Asian” volume published so far. This increase in representation boosts the entire series’ overall quotient to 20.3 percent (compared to 19.2 percent as of last year’s publication). As usual, I’ve included an Asian Meter chart to illustrate the comparison with previous years. This progress is especially notable for the number of new Asian writers. 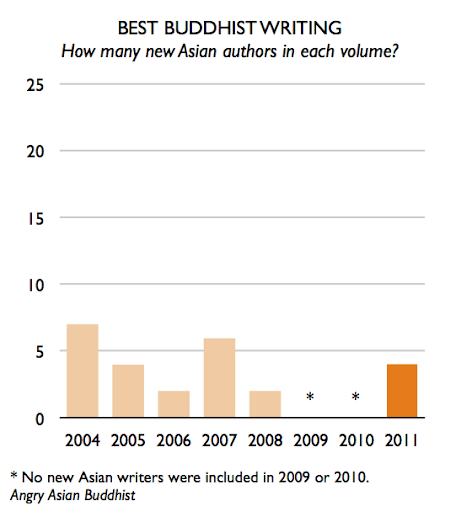 Many of the writers in The Best Buddhist Writing also have been published in previous volumes; in the past three years, 42 (2008), 58 (2009) and 61 (2010) percent of writers in Best had also previously appeared in the series. In the last two years, none of the new writers were Asian; all Asians in those volumes also had work published in previous volumes of Best. In contrast, of the nine Asian writers included in this year’s volume, four are new. That said, progress is progress. Not only has the Asian quotient improved over last year, this year’s quotient is the highest yet. I hope with all my heart that they will keep up this good work.